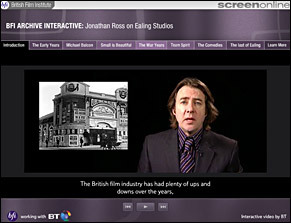 In the second of our series developed in partnership with BT, Jonathan Ross introduces an interactive guide to the work of Ealing Studios, from the 1910s to the late 1950s. Best-remembered today for its comedies, Ealing was about much more than that. Join Jonathan in a unique tour of this fascinating and much-loved studio, and choose your own path to suit your interests. This tour requires Flash Player, which you can download from the Macromedia website. These links will open in a new window. Clicked on a link and nothing happened? Please make sure your pop-up blocker is off!